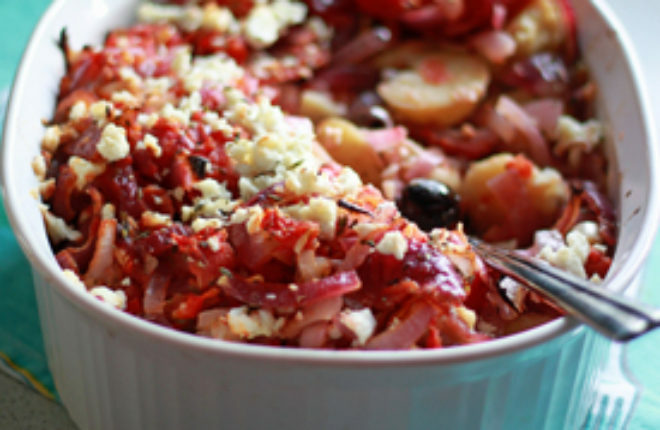 Tender baby potatoes tossed with briny kalamata olives and then topped with a tangy tomato-onion mixture and a generous crumble of feta cheese. This versatile side is hearty enough to make a satisfying main for the vegetarians in the family. When I heard about Alyssa and Faith’s brilliant Food Blogger Cookbook Swap, I knew I had to take part. I am a cookbook fiend – no better bedtime reading than a fresh, brand-spankin’-new-to-me cookbook. I’m weird. The premise is this: Send a gently used cookbook from your collection – perhaps one that’s collecting a bit of dust – to another food blogger that also signed up for the swap. And you’ll receive one, too! I was totally in. I sent a candy-making cookbook called Sugarbaby to Adriana of Great Food 360. And then my cookbook arrived. Yay! 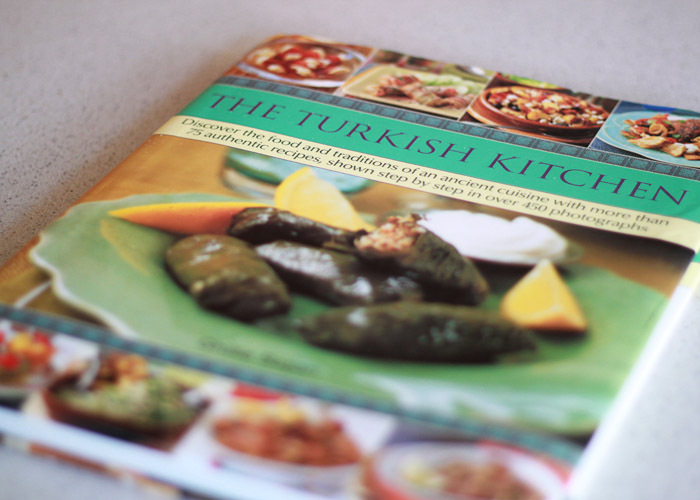 The multi-talented Rose of Avocado Bravado sent me a lush, oversized Turkish cuisine cookbook that she picked up during her travels in Istanbul a couple of years ago. Lucky me! 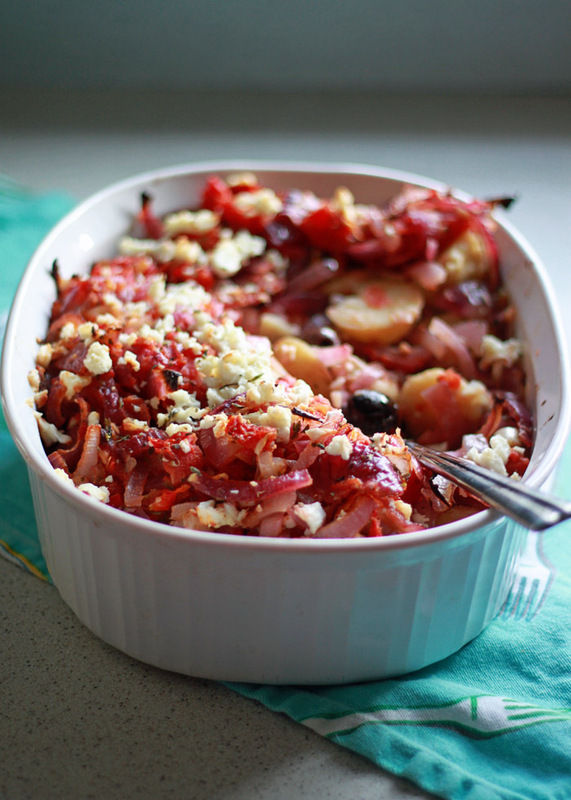 The section of vegetarian recipe contained mouthwatering choice after mouthwatering choice, but ultimately I settled upon a recipe for Potatoes Baked with Tomatoes and Feta. I’m an olive nut, so it was important for me to double the amount of olives called for in the recipe, and then add “olives” to the title. Olives are one of life’s little pleasures. Especially kalamata olives. Come to mama, dear olives. 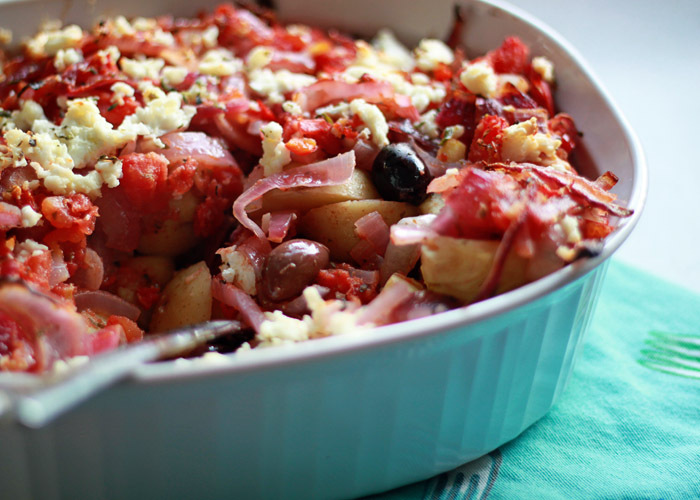 Anyway, these Potatoes Baked with Tomatoes, Olives, and Feta are certainly a main-dish-worthy side. 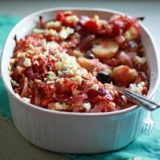 A mix of diced tomatoes, red onions, and spices blanket Baby Yukon Gold potatoes and kalamata olives. Crumble some feta cheese over the top, and then bake to perfection. It’s a traditional Turkish dish originating from the heart of Turkey. It’s supposed to be baked in an earthenware dish, so if you have one, put it to use! I do not; but I might need to change that if I keep making it. And I’m pretty sure I will. Fill a large pot about halfway with water, and add the potatoes. Set on the stove over high heat and bring to a boil. Boil for about 20 minutes or until tender. Drain potatoes and rinse with cool water. Set aside until cool enough to handle, then cut into thick slices. Add the olive oil to a heavy pan set over medium heat. Cook the onions until soft, about 5 minutes. Add the garlic, cumin, chili, and oregano and cook, stirring, for another minute. Stir in the sugar, vinegar, and tomatoes. Add a couple pinches of salt and a bit of freshly ground black pepper. Taste and add additional salt if you'd like. Add the potatoes to the baking dish and top with olives. Toss lightly. Pour the tomato mixture over the top. Crumble the feta over the tomatoes, drizzle with a little olive oil, and sprinkle with the remaining 1/2 teaspoon oregano. Bake for 25 - 30 miinutes until heated through. Serve hot, topping individual servings with dollops of yogurt and lemon juice as desired. Pingback: Let’s Get Saucy! 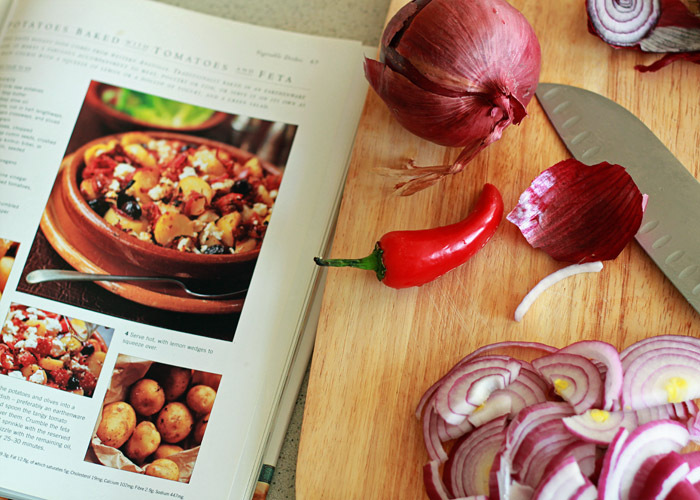 In Which Our Heroine Joins a Cookbook Swap | I'm Gonna Cook that! Oh what a beautiful dish! I can think of no better combination of ingredients! The book looks wonderful. I hope you enjoy cooking many fabulous recipes from it. And I own and LOVE the book Sugarbaby! So glad to have been introduced to your lovely blog through the cookbook swap! Thank you so much for your sweet comments, Anne! Isn’t Sugarbaby such a pretty book?! You made a beautiful dish from your new cookbook. I hope you find many more recipes that inspire you in it. What a fun Swap! Beautiful dish! I absolutely love Turkish cuisine. This was such a fun swap! Wasn’t it fun?! I am new to Turkish cuisine, so the book I got was a true treat. Thank you so much for participating in the swap and helping to make it a success! I’m a sucker for Turkish food and your book would keep me occupied looking through it for hours, lol. I love the dish you made! Thank you so much for my book! I’m enjoying Sugarbaby a lot – it has been very educational. These potatoes look absolutely delicious. What a great find! What a great cookbook! I love Turkish food – and this dish looks great. This was so much fun. I’m passing a link to your blog along to a friend who is vegetarian while the rest of her family is not. Thank you so much for sharing my blog, Susan! So nice of you. Thanks, Alyssa! You gals executed the swap flawlessly – I have been so impressed. Thank you so much for doing it. What a lovely cookbook treat! I’m with you – best bedtime reading is a new cookbook. Fun to discover your blog through the exchange and look forward to reading more! Thanks so much, Christy – ditto! We have a mixed diet kitchen too, and a good side is essential for maintaining delicious dinners for the both of us! What a fun endeavor! And I love the recipe you chose to share. It’s perfect for me. BTW – very fun to find your blog. We have a similar blog theme – living in a mixed marriage of mostly carnivore and mostly vegetarian eating together at the same table ! My husband just cannot have a meal without his meat, so I call him Carnivorous Maximus LOL. I love the Cookbook Swap idea! It inspired this beautiful dish (and others I’m sure). Turkish food looks well worth exploring. Pingback: Cajun Chicken Tacos with Corn Salsa | Healthy. Delicious.